In September 2003, sang at "Blue Note" Jazz Club, in Manhattan's Greenwich Village, New York City. Is an international singing sensation. He has gone multi-platinum in over 15 countries. In 2005, he traveled the world over a dozen times, performing sold-out shows throughout the U.S., Europe (including a sold-out performance at the prestigious London's Royal Albert Hall), Asia, and Australia. His self-titled debut went multi-platinum, and his multi-platinum CD, "It's Time" (which included the No. 1 Buble-penned smash single "Home") sold over 5.5 million CDs worldwide. As of October 2006, "It's Time" went 6 times Platinum in Canada, 4 times Platinum in Australia and Italy, double Platinum in Singapore and USA. Platinum in the UK, Austria, Germany, Holland, Hong Kong, Indonesia, Ireland, Switzerland, Taiwan and South Africa. Gold status in Belgium, France, Philippines, Sweden and Thailand. As of 2007, "It's Time" remained on the Billboard Traditional Jazz Albums Charts for a staggering two years and in the No. 1 slot for over 80 weeks, holding the all time record for highest number of weeks at No. 1 by any artist. The internationally acclaimed hit original song "Home" reached No. 1 on charts in more than 10 countries, including Japan, Canada and Italy. "It's Time" was nominated for 2 Grammy Awards and was the Bestselling Traditional Jazz Album of 2005. Received two Genie Award nominations in 2000 for songs he wrote for the film Here's to Life! (2000) starring Eric McCormack. Won 4 Juno Awards (2006) for Best Single of the Year "Home", Best Album of the Year "It's Time", Best Artist of the Year, and Best Pop Album of the Year "It's Time". Won 3 Canadian Smooth Jazz Awards (2006) for Male Vocalist of the Year, Album of the Year "It's Time", and Best Original Composition "Home". When Michael's 2006 Valentine's Day EP - "With Love, Michael Buble"- was released only for a week, the album reached Gold status selling 500,000 copies. The album also became the biggest selling CD Hallmark has ever released, selling in excess of 3 million copies. [19 January 2007] His album It's Time broke the all time record for highest number of weeks at number 1 by any artist. It's Time spent 76 weeks in the number 1 spot on Billboard's Top Traditional Jazz Albums Charts. According to the Nielsan Soundscan charts, which tracks weekly industry sales in America, both the Traditional Jazz Album and the Current Jazz Album charts lists It's Time at an amazing total of 101 weeks on the charts with sales exceeding 2.2 million to date. During preparation for his daughter's wedding, Brian Mulroney was hesitant to listen to Buble's CD, given by Mulroney's speech writer Michael McSweeney after a corporate gig, because the wedding had a long list of entertainment. However, it was Brian's wife, Mila, who told him to listen to the CD and include Buble in the entertainment list, after which Buble was invited to sing in front of wedding guest David Foster, who later produced Buble's self-titled album. In 1996, he landed a role as Elvis in the Vancouver run of a Rock and Roll musical revue called Red Rock Diner, where he became friends with Debbie Timuss, a stage actress, dancer and singer who taught him the choreography. Two years later they became an item and moved to Toronto as part of the cast of another musical revue, this time a big band musical revue called Forever Swing. The hit single "Home" from the album It's Time was written for Debbie Timuss, whom Bublé has had a near decade long off-again-on-again relationship. Having gotten back together from one of their breakups and away in Italy on tour, he penned "Home" for Timuss, describing his pain from being away from her. She is the song's background vocalist and is featured in the song's music video. He referred the album It's Time as "Debbie's Record", and a few of the tracks on It's Time was recorded while he sang to her as she sat outside the studio. They became formally engaged pre-Christmastime 2004 and called off the engagement November 2005. At 18, Bublé entered a talent contest in a local bar even though the rules stipulated contestants had to be 19. After he won, the organizer, a local publicist and entrepreneur named Beverly Delich, disqualified him but was so impressed by his talent that she later called him at his parents' home and suggested he enter the British Columbia Youth Talent Search. He won, and Delich then helped him record an independent CD. On March 19 2007, his self-penned single "Everything", from album Call Me Irresponsible, made the highest debut in the history of the BDS AC (adult contemporary) charts. In its first week at Canadian radio, "Everything" debuted at #3 on the BDS Mainstream AC Audience chart, and a week later it reached #1 Airplay. Also in its first week, it was aired over 300 times on 43 Radio Stations, reaching an estimated audience in Canada of over 5.2 million listeners. The U.S. Billboard ranks "It's Time" as the Best Selling Jazz recording of 2005 and chose him as the #1 Jazz Artist. The original song "Lost" (from album Call Me Irresponsible) is the sequel to his hit single "Home" (from album It's Time). 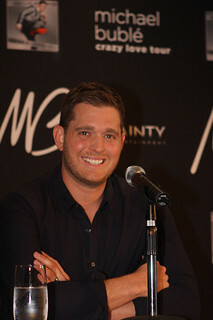 While in Australia, Bublé co-wrote "Lost" during the process of ending his eight year relationship to Debbie Timuss, whom he had previously written "Home" for while still together. "Lost" was written as a tribute to his former relationship to Timuss. Before "Lost" was released, Bublé played the song to Timuss. However, his current girlfriend Emily Blunt is the inspiration to the original single "Everything" (from album Call Me Irresponsible). First met Emily Blunt at the Australian Logie Awards in 2005 and again a few months later backstage with a group of people at his Los Angeles concert. Dean Regan's touring musical, "Forever Swing", was a major factor in launching his early career. His starring role in "Forever Swing" gained huge praise by both fans and critics throughout Canada and the United States. "Everything", the first hit single from the 2007 album Call Me Irresponsible, boasts the fastest trip to Number 1 in three years on Billboards Adult Contemporary chart. By December 2004, his self-titled debut album sold over three million worldwide including seven times platinum in Australia, three times platinum in Canada, twice platinum in the United Kingdom, South Africa, Italy, New Zealand and the Philippines, and gold status in Indonesia, Malaysia, Spain, Taiwan and Hong Kong. By 2004, he had sold-out engagements throughout Europe, Australia, and Asia, including 3-night sold out shows at the Sydney Opera House's Concert Hall in April and sold-out an unprecedented 9 shows across Australia; in November 2004, he completed 16 sell-outs in the U.K. alone, most notably two SROs at London's prestigious Royal Albert Hall. 2006 Grammy Award-nominations: Best Traditional Pop Vocal Album for "It's Time", Best Instrumental Arrangement Accompanying Vocalist for the song "Can't Buy Me Love". On May 16 2007, Call Me Irresponsible was the #1 best selling album in Canada, Australia, South Africa, Europe, Singapore, and the USA. Call Me Irresponsible also reached #1 on the Billboard's Sales Charts, Internet, Traditional Jazz and Pop charts. Sang at a wedding for only the second time when he headlined the entertainment at the $6 million wedding of James Packer, Australia's richest man, and Erica Baxter in France on June 2007. The first time he performed at a wedding was for the Canadian Prime Minister's daughter in 2000, where he got a record deal. Won 2005 World Music Award for category World's Best Selling Artist/Canada. 2005 World Music Award nomination for World's Best Selling Pop Male Artist. Won 2006 Canadian Radio Music Awards for Best New Solo Artist (Hot AC category - song "Home") & SOCAN Songwriter of the Year for the song "Home". Won 2006 German ECHO Award for National/International Jazz Production of the Year - "It's Time". 2006 ECHO Nomination for International Newcomer of the Year. According to an "Oprah" interview on October 9, 2009, Bublé had dreamed of becoming famous since age two. When he was a teenager, he slept with his bible and prayed to become a singer. The first time that his family noticed his singing talent was at Christmas time when Bublé was 13 years old, and they heard him singing along with them to the song "White Christmas" during a car ride. Frequently closes his concerts by singing without a microphone. This all began when his microphone went out during one of his L.A. concerts when he was in the middle of singing "My Funny Valentine", the show's big finishing number. Without missing a beat, Alan Chang, Bublé's pianist, kept playing his piano, and Bublé did an acoustic version of "My Funny Valentine" that brought down the house. You can try to trick the people and come out wearing a fedora and a tuxedo but that's not me. I was born in the late '70s, I wear jeans. I don't hang out in casinos. The lifestyle isn't my thing. I don't drink martinis and I don't smoke cigars. [His words to Michael McSweeney when he gave him his independent CD in his pre-stardom days]: "If you and your wife like it, great. If you don't, it'll make a great coaster". [About his last name Bublé]: Sounds French, but I'm a very proud Canadian of Italian extraction. I've said it a million times: I would love very much to be known as one of the great entertainers. If that's me having a big ego, then sorry. I'm shooting for the stars, and if I miss I'll hit the moon and that's pretty high. [About covering songs]: "It's far more difficult for me to cover a song because you can compare that song with another 400 iconic artists who have recorded it. So it's my job to take it to a different place. And as an interpreter, I take it really seriously. When I'm remaking a song, I'm aware that I'm not here to sing the song better than Frank Sinatra or if I cover Van Morrison or I cover The Eagles, my job isn't to sing it better, my job is to make it my own". [About covering songs versus original music]: "The reason I won't do all originals is because it is more of a challenge for me to take great songs and to reinterpret them and make them new again. It's what I do. It's always what I've done and had a passion for." I don't just want to cover a song because it's easy, like 'Fly Me to the Moon.' I like that song. It's a great song. But I don't want to cover it just because it's one of the most popular standards. I wanted to take chances and record songs that I thought I could breathe new life into. I am a candid interview and I have a dark and dry sense of humor - a very Canadian sense of humor and I am only learning now stupidly that you can't read tongue. When I say something funny in a newspaper and I meant it to be funny, it doesn't read that way. It is the same if you have ever gotten an e-mail and you think, 'What did I ever do to make this person respond this way?' They never meant to be aggressive, but you can't read the tone. I've said things. There were comments about many things I wish I would have said in a different way or a more eloquent way. [About his former job as a singing telegram messenger]: "Ten out of 11 times they wouldn't [tip]. They'd say, 'I want you to sing it louder.' And I'd be, 'But it's a ballad.'" [About singing jazz music] "I don't want to be a copycat. What you see is who I am. It's just me and how I grew up and what I thought was cool. There was always something special about that music to me. It just stood out. I always felt like I was born in the wrong time." [on becoming successful]: "People told me time and time again that I will not get signed up, that I will never sell record, that I should sing pop and that I would be better off joining the Backstreet Boys. But I have faith in who I am, and in this style of music (jazz). So when people continued to tell me that I couldn't do it, it just made me feel that I had to prove them wrong." When I did my first album, I was marketed as the singer who would appeal to your grandma. But as each record arrived with more power and confidence, I began to sound younger and younger.